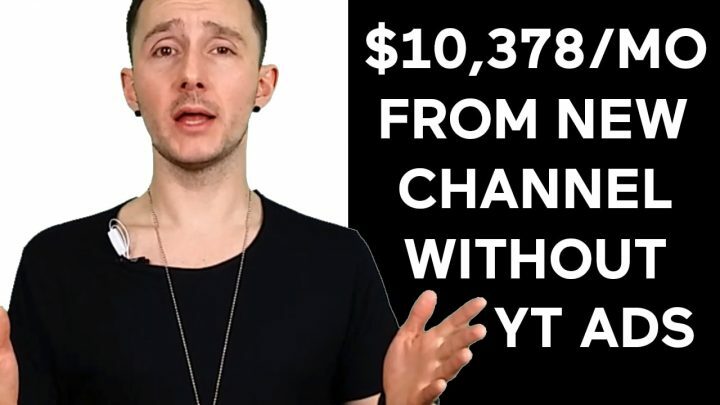 This is Luke Kubow from myimplace.com and in this short video I’m gonna tell you how to make money your videos, especially after the new YouTube update, because I saw a lot of people talk about it in Facebook groups and I have a very efficient fix for that, so make sure you watch to end because you can make a lot more money from your videos than you would ever make from the AdSense even if you have a fresh channel. The new YouTube monetization rules say that you need to have at least 4,000 hours of watch time within the past 12 months and at least 1,000 subscribers to enable the monetization, which is the AdSense. Being totally honest with you the AdSense is for kids and it’s the least efficient way to make money on YouTube. I don’t want to offend anybody and if you’re making money from AdSense then I have good news for you: you can make at least 10 times more. On my other channels I have tens and even hundreds of thousands of views, but back in the days I had no idea how to properly monetize them so I was barely making any money, like most beginners do. Now I do YouTube marketing for a living, I stand behind some major TV stations because I used to work for marketing agencies and even from my pretty fresh channels I make more money than a lot of YouTubers with a bunch of subscribers. In my video marketing environment, people literally laugh at AdSense and make huge huge money thank to video anyway. Today we’ll focus on my number one method of making money on YouTube. There are at least two more, but I’ll be talking about them in one of my next videos, so make sure you subscribe and hit the bell icon to get notified, because you don’t want to miss that. You can easily make money by promoting affiliate offers or your own products. By your own products I mean for example courses: no matter what’s your channel is about, people in your niche have problems that they need solutions for, and of course you can make free tutorials about it, but you can also do paid courses and sell them on ClickBank or JVZoo. The links to these websites you will find below this video in the description. As I know that having your own products at the beginning may seem to be a little bit scary, so let’s talk about the affiliate offers. Let’s say you have a fitness channel. By teaching people how to get a six pack you teach them about how to eat, what to eat and what supplements are the best for the fastest results. You go to the place like OfferVault, search for the fitness offers, you sign up for the products you want to promote, get your unique referral link and when people buy the supplements using this link you earn the commission. And the affiliate commissions like that are a lot bigger than any AdSense clicks. OK, let ‘s say you have a gaming channel. You type “gaming” and you have a bunch of games to review on your channel. When people get those games using your referral link you earn your commission. Let’s say you have a beauty or make-up channel. You go to the OfferVault, search for cosmetics and voila – you have many products to promote. “how to” videos, like for example “how to get a six pack without a hard diet” or sth like that. You just need to choose the right keywords, and rank your videos for those keywords. Of course, this is very long story short and I’ll be explaining everything in my next videos, so make sure you subscribe and share this video with your friends, with the YouTube community, in the Facebook groups, wherever, just to help people make money and grow their channels. For now that’s it and I’ll see you in the next video.